My Happy Place si trova in una fattoria di famiglia di 5a generazione di 160 acri situata a pochi minuti dall'arca. Io e mio marito viviamo nella fattoria, così come i nostri due figli e i nostri tre nipoti. C'è una bella vista dell'arca mentre si guida verso il retro della fattoria dove si trova My Happy Place. E 'isolato, molto tranquillo e ha un sacco di spazio aperto per far giocare i bambini. Non devi mai preoccuparti del traffico o delle strade trafficate. La casa è spaziosa e ha un portico meraviglioso dove è possibile sedersi, dondolare, rilassarsi e guardare la fauna selvatica in visita. Buca per il fuoco completa di legna e bastoncini per coloro che possono gustare un salciccia o semplicemente godersi il piacere di sedersi intorno al fuoco e guardare il tramonto, le stelle o rincorrere le lucciole. Peaceful, great sunsets and sunrise. Sherry was great.... met us at the barn, had a gift of fresh bread....”wonderful”. The location to the Ark Encounter was great. We enjoyed walking the property. The house is perfect, very relaxing and comfortable. We would recommend it as a great place to stay. We stayed at My Happy Place while visiting the Creation Museum and the Ark Encounter. It is very convenient to both. The owner is a wonderful hostess. Upon our arrival, she brought us a loaf of delicious homemade bread that we munched on until there was not a crumb left! The place was super clean and all the amenities of home were available, including Wi-Fi and Netflix. We highly recommend My Happy Place to those coming to the area. Three of us came from Oklahoma, California , and Florida to reunite and catch up. This rental met all our expectations. 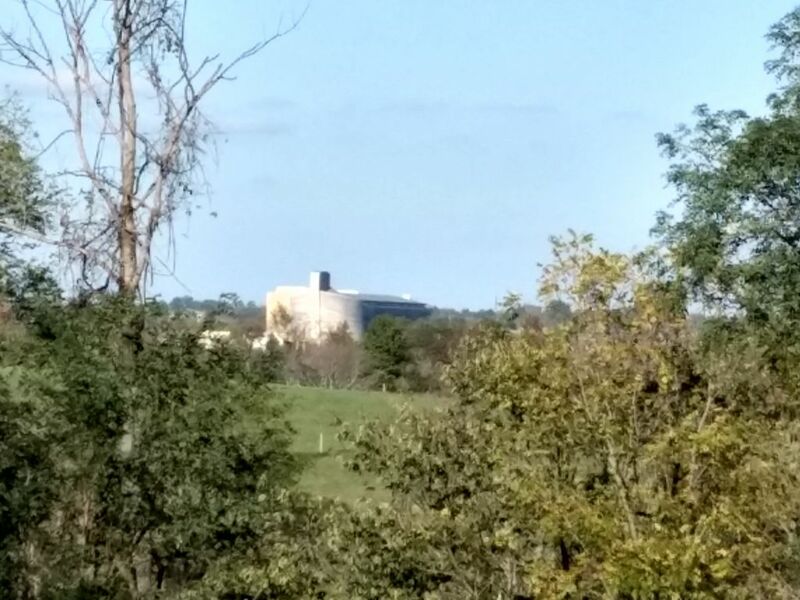 We loved the seclusion and the proximity to the Ark Encounter as well as the locations a little further south such as Georgetown and Lexington. The owner is very friendly and gracious and responsive. Totally a wonderful place to get away. The most peaceful place on earth and the owner is such a sweet heart. Anyone who is looking for someplace to just unwind and relax should consider this lodging. We greatly enjoyed our stay at the "Happy Place." We were there with two grandsons and there was plenty of room for them to run around outside and play, and the inside accommodations were spacious enough we all had enough room that we didn't bump into each other. Everyone thoroughly enjoyed having a fire in the firepit two nights, as well as the stories shared by Chris, who helped us start the fire on the first night. The home was more than well stocked; there were more items than usual for a VRBO. Sherry, our host, was very kind and welcoming, yet not intrusive at all on our privacy. The home is nicely decorated and the cleanest one I think we've ever stayed in. We drove less than an hour away to see the Creation Museum on our first day there and then had a very quick few minutes drive to the Ark Encounter on our second day. It was a perfect spot for this spring break trip! We had a wonderful time. It was all one could wish for. Home away from home with a beautiful view. Super relaxing! And the bread was delicious! Thank you for your hospitality Sherry! It was great to meet you! We will be back. Maggie, we are so glad you and your family came our way. It was so nice to meet y'all and we definitely welcome you coming back. Thanks for taking such good care of our property.